A great movie for all age groups! 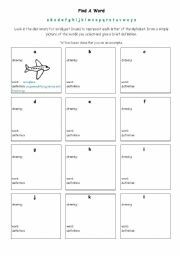 This worksheet covers a broad spectrum of vocabulary and develops listening and writing skills. Most of the worksheet should be completed whilst watching the movie. ANSWER KEY included. Forrest Gump is one of the best movies of all time and will engage students! This worksheet covers a broad spectrum of vocabulary. Most of the worksheet should be completed whilst watching the movie. ANSWER KEY included. 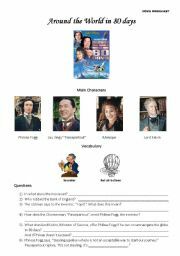 Around the World in 80 days is a fantastic adventure movie for esl students of all ages. My adult students loved it! 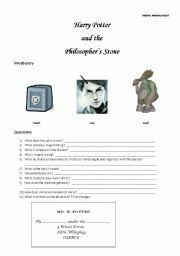 The comprehension worksheet is to be answered whilst watching the movie. This worksheet puts tenses into perspective in an entertaining story form. It encompasses 9 different tenses - present simple, present perfect simple, past simple, past continuous, past perfect simple, future simple, future continuous, future perfect simple and future perfect continuous, and teaches vocabulary at the same time. ANSWER KEY included. 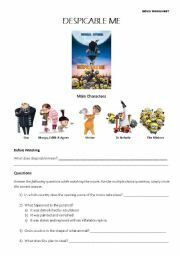 This is a comprehension worksheet which students should complete whilst watching the movie. My students are hooked on Harry Potter and so we are making our way through the series. There is new vocabulary to be learnt in each movie. This is the 3rd movie out of a series of 7. 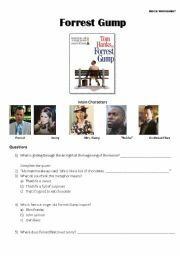 Students should answer the comprehension worksheet whilst watching the movie. This WS should be paired with my PowerPoint Presentation of the same title. 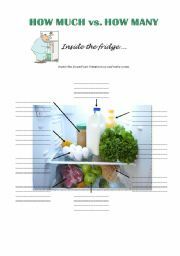 This exercise focuses on using "how much" and "how many" - something esl/efl students struggle to grasp. Students should use this WS to make notes during the PPT. 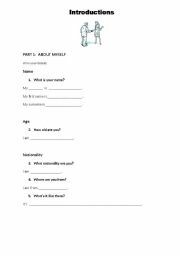 This worksheet is ideal for absolute beginners practising greetings, starting converstations and talking about themselves. An engaging presentation for absolute beginners - perfect for their very first lesson in English. Students learn how to introduce themselves, make conversation and greet at different times of the day. Teacher must narrate and have students repeat throughout the presentation. A powerpoint presentation on Sport which grasps the attention of the students. This PPT Presentation is a follow-on from my "Introducing Yourself" PPT Presentation. It�s great for absolute beginners, teaching them conversational phrases, i.e., "Pleased to meet you." Part 2 of this series. Perfect for absolute beginners! Part 3 of this series. Perfect for absolute beginners!